Round neck jumper by BOGNER: superbly soft designer knitwear! 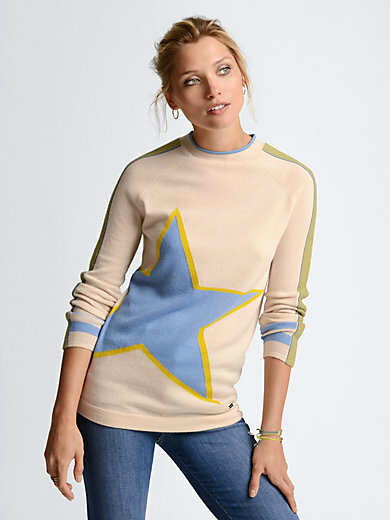 The ingeniously knitted-in XXL-sized star on the front is a real eye-catcher. The raglan sleeves have a small wave knit pattern with fine stripes. Straight cut with a high, fashionable round neckline and small metal logo at the hem on the front. 100% new milled wool. Length approx. 27ins. The round neck jumper is machine washable.